Another solid win for the Dodgers, who have taken seven of their last 11 games and tonight, look to win their fourth consecutive series for the first time in over a year. Of course, we aim to provide something a little different here at Inside the Dodgers, so we switch gears for a moment to basketball. With the NBA Finals in full swing and Dee Gordon getting called up yesterday, it sparked a dugout conversation during Don Mattingly’s pregame interview about Dee’s athleticism on the court. He played primarily basketball until high school, when he finally started playing baseball. And it got me thinking – who would be the best basketball team made up of current or former Dodgers? 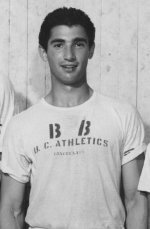 Of course, you’d have to include Sandy Koufax, who went to the University of Cincinnati on a basketball scholarship. And Matt Kemp, who had offers to play collegiately, who probably be your forward. Dee Gordon would be a nice point guard and our center would have to be Mark Hendrickson, who was the tallest Dodger at 6-foot, 9-inches and also played in the NBA as a power forward. Perhaps Billy Ashley could fill that role for the Dodgers – he was a house, but I have no idea if he could hoop. I guess that’s my starting five, without much research. Honorable mention as a sixth man goes to Double-A manager John Shoemaker, who never played in the bigs but was the captain of the Miami (OH) basketball team and was selected in the sixth round of the 1978 NBA draft by the Bulls. Stories of his shooting exploits on the court at Dodgertown in Vero Beach are legendary. And from what I hear, Donnie Baseball was actually a pretty good player growing up in Indiana. Anyone know any good stories about Dodger players who could pass, shoot or dribble? Just a fun little diversion from the everday stuff on ITD. As promised, I’m trying to post more often and this popped into my head yesterday watching Dee fly around the bases in his first big league start. What did you think of the half-price throwback days? AnnaNosova on A new thread! diumeHef on A new thread! TromasHaift on A new thread!